This afternoon I went to see Disney’s new Winnie-the-Pooh. 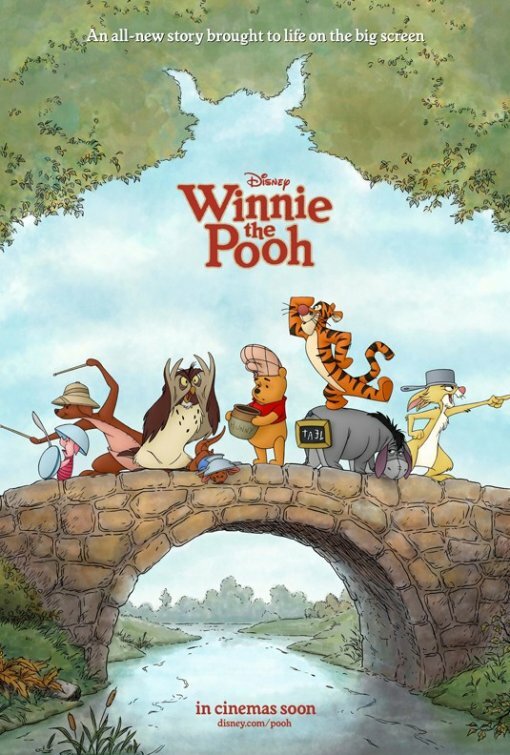 This was the first theatrical Pooh movie since 2005’s Pooh’s Heffalump Movie, and it’s Disney’s first traditional cel animation movie in a few years, since The Princess and the Frog. Pooh and I go back a long ways. I don’t know if The Many Adventures of Winnie-the-Pooh was the first movie I saw in the theater, but it was surely one of the first, and it was certainly the earliest film to make an impact; my mother tells me I learned to swing on a swing-set thanks to a scene in Many Adventures. Of all the movies coming out this summer, Winnie-the-Pooh was the movie I was most looking forward to. Not just because of the soundtrack (featuring songs by Zooey Deschanel), though that was a not insignificant factor, but because Pooh is one of those things from childhood I’ve never managed to give up, and I can’t imagine that I’d ever want to try. I have Pooh beanies, I wrap presents in Pooh wrapping paper, I send out Pooh cards, I have a Pooh print (of sorts) hanging in my gallery. I’ve given my niece, who’s not quite three, some nice (but expensive) Pooh collectibles starting when she was a month old. Pooh and I are simpatico. I went to the theater, I bought my ticket, and I was, without a doubt, the oldest childless person in the theater. The movie isn’t very long, just a shade over an hour, and that’s including “The Ballad of Nessie,” an unrelated Suessian fairy tale, narrated by Billy Connolly, about the Loch Ness Monster. Winnie-the-Pooh is structured much like Many Adventures, with a live action intro with a narrator (Monty Python‘s John Cleese) that shows Christopher Robin’s room and his toys, and then it segues into an adventure in the Hundred Acre Wood — Pooh, who is out of honey, tries to find a smackeral of something to eat, but his efforts are thwarted by 1) Eeyore’s missing tail, 2) Christopher Robin’s disappearance, and 3) the menacing monster known only as the “Baksun.” Naturally, all three plots are resolved satisfactorily, and Pooh finally manages to settle that growling stomach of his. All the things you expect from a Pooh movie are here. Pooh dreams of honey. Piglet cowers in fear at unseen (and non-existent) threats. Eeyore is gloomy. Owl pontificates. Rabbit is mental and prone to hysteria. Tigger is endlessly exuberant. Christopher Robin is basically a non-entity. There are songs. The narrative style, with the narrator and the book he reads from interacting with the on-screen characters, is maintained (though the interaction of the characters with the text is overdone and provides an unfortunate deus ex machina resolution to a plot problem). The voice acting is generally solid. Jim Cummings is back as the voice of Pooh and Tigger, and I was quite impressed with Craig Ferguson’s Owl (who has surprisingly a lot to do). I missed John Fiedler’s definitive Piglet, and Peter “Optimus Prime” Cullen was sorely missed as Eeyore. I was entertained, and I laughed, but for me Winnie-the-Pooh was adequate. The film had the right look (the backgrounds especially are lush in their artistry and colors), the characters had the right feel, but there wasn’t any spark. Similar to my feelings on the latest Peanuts special, Happiness is a Warm Blanket, Charlie Brown, I thought that Winnie-the-Pooh felt overly familiar. I knew not to expect genius from the film (the early reviews from Britain, where the film opened in April, were average at best), but I wanted something more than the film gave me, even if just a brief appearance from Gopher or Lumpy. Of course, I’m far from the target audience for the film; my expectations were far from the thoughts of the film’s makers. For the audience the film is made for, Winnie-the-Pooh does what it needs to do, and it does it entertainingly, and it does it well. If you love Pooh, as I do, Winnie-the-Pooh is sixty minutes of enjoyment. It’s not deep or meaningful, it’s not a movie that you’ll think about when it’s over (unless it’s to ruminate on Zooey Deschanel’s lovely singing voice), it’s just an hour spent with old friends as they go about a day of excitement and adventure in the Hundred Acre Wood. Anything more than that, and you’re wanting the wrong things from a Winnie-the-Pooh film.